We'd love to have you! We are always looking for help with the event and this is your chance to be a part of it. The kids will be working hard and having a blast, but sometimes they may need little reminders to stay on track, that's where you come in. Making sure the next person is on deck with their teams is the bulk of the responsibility. 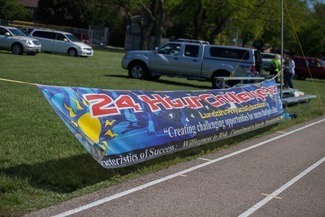 Be a part of this event and see your kids achieve this 24 hour challenge. We will be having a meeting on Tuesday, May 21st at 6:00 pm in Lundahl's library to go through all the details. In the "My Comments" section please add the times you are available including if it's AM or PM. All times are available as we will be grouping the help where it's needed. We will end up using around 75 parents throughout the 24 hours. We ask for a minimum of 4 hours all the way up to the entire 24 hours, after all you don't want to miss any of the excitement! Times that you are available. Entire 24 hours! - Awesome! I’m aavailable for full 24 hours! I am good for all 24 if needed.